The Required Field Mark and Required Field Note settings on a Custom Form asset are now editable in Edit+. Previously you were only able to edit these values in Admin Mode. The Export Assets to XML tool now lets you customise the filename of the resulting .tgz file that gets generated from the export process. Previously this file was always being named export-1234.tgz, where 1234 was the asset ID of the export root node. This often made it hard to differentiate multiple export files if you didn't manually rename the files after download. There is now a Export File Name text field on this screen that lets you customise the filename of the export file and it also supports the use of asset keywords. The default value will use the first export root node asset's name and ID as the filename. The name will also automatically become filename friendly, meaning things like spaces will be replaced with dashes. 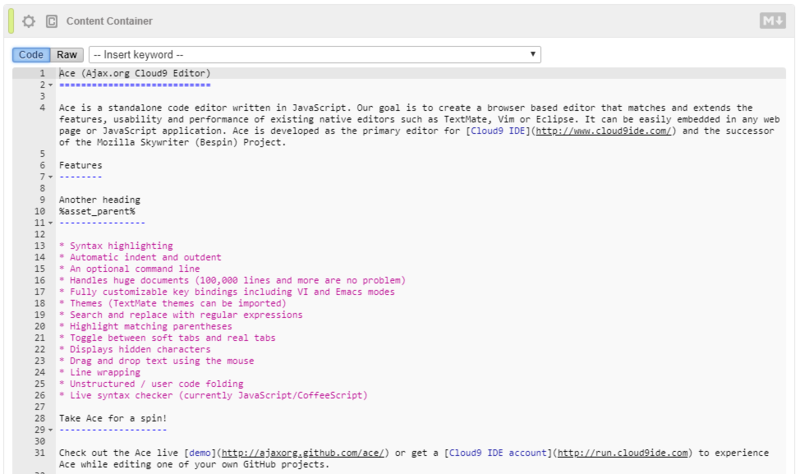 Markdown Content Containers will now use the Ace Code Editor for editing the content within them. Previously these were simply using a standard <textarea> field which made it quite hard to edit. In read-only mode, you can also switch between code and preview view to see what HTML the markdown code has generated. Switching to a different backend locale for Edit+ is now a bit easier. When you switch the Default Backend Locale setting on the System Configuration screen to another supported and translated language, Edit+ will automatically include the additional required JS translation file when using the Edit+ Design Area in the Design file. As per idea #12021 , the <html> tag produced in both Admin Mode and Edit+ interfaces will also include the relevant lang="" attribute to help tell your browser that the content is rendered for a specific language. For example, when switching to Polish, this attribute will be set to <html lang="pl-PL">. #12002 - Problem in changing multiple status when processing status change in web mode with Hipo. #12013 - Permission issue when changing the status of a page to Safe Edit with workflow schema applied on the Page.